Discussion in 'Politics' started by TreeFrogTrader, Mar 4, 2019. Governor Hickendipshitter. Because apparently too many is not enough. Only another 2-4 more to go. Biden and Eric Swallow-well, and probably a couple others I can;t think of right now. On the other hand, I expect Kirsten Gillibrand to be dropping out soon. Maybe working at Arby's. Zero interest there for her from anyone, anywhere. And Fauxcahontas is polling at 7% right next door in New Hampshire- not because she is not known- but because she is. In Colorado, we refer to him as "Dickenlooper". At least he is an entrepreneur. Know nothing of his politics though. Took in a concert at Red Rocks "Old Crow Medicine Show" last year while doing some work in Denver. He was there pitching a program gifting musical instruments to underprivileged children. Not a bad idea. Everyone there loved him, come to think of it, everyone there was stoned as well - so not sure how to interpret that? I dont know- it's complicated now. 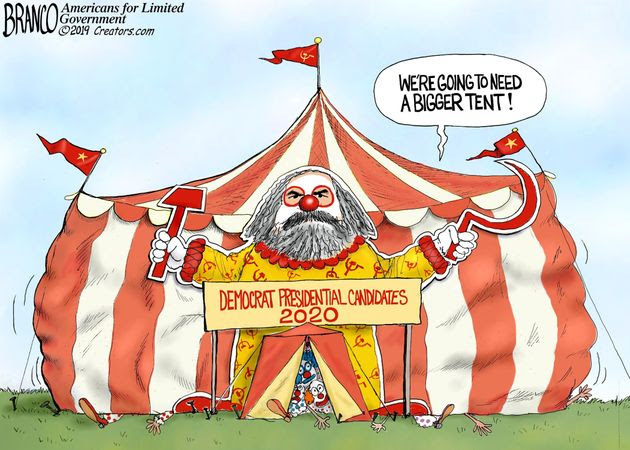 So many dems in the dem clown car that you have dems like Cuban and Schultz saying that they are running basically as dems but not in the dem clown car.......ie as independents. Let us see if the Democrats rake him over the coals like Schultz! He has not announced yet. I hope Mark Cuban does make it official! Here is one more. She said she is not running. Not convinced at all! Won't run but wont go away either. Will just buzz louder. Let's see how many candidates national and state and local ask for her help on the campaign trail. More likely they will offer to make a donation to the Foundation is she stays away. Works for her. smallfil and TreeFrogTrader like this.